Wall Street welcomed millennials to the world of investing by showing them the scariest financial crisis since the Great Depression. The economic chaos of 2008, which erupted during the formative years for many young Americans, inflicted scars on millennials that are shaping their investing decisions today and possibly hindering their future retirement prospects. Ninety-three percent of millennials say that both distrust of markets and lack of investing knowledge make them less confident about investing, according to a new Capital One ShareBuilder survey released exclusively to CNNMoney. A similar analysis by State Street found that millennials are also holding a significant chunk of their portfolio -- 40% -- in cash despite historically low interest rates. The findings suggest young Americans may not be getting the exposure to the stock market that has helped previous generations accumulate wealth. Related: The bull market is six years old. Now what? "Millennials are quite gun shy when it comes to investing. You can't blame them; it's rational behavior," said Suzanne Duncan, global head of research at State Street's Center for Applied Research. 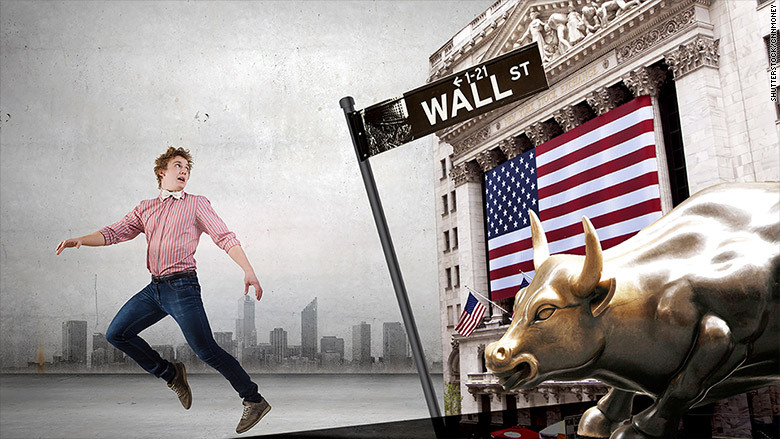 Nearly 60% of millennials surveyed by ShareBuilder say they distrust financial markets. "There's a comfort in cash that's far more powerful than the lure of the markets," she said. Deeply skeptical about stocks: That comfort stems from the fact that many millennials have experienced twin crises -- the dotcom bubble and the 2008 financial crisis -- that hurt people with great exposure to risky assets like stocks. The Nasdaq is only now returning to the levels of 15 years ago. The Great Recession was a particularly dark time for investors, with the S&P 500 melting down almost 60% and big companies like Lehman Brothers and General Motors (GM) going bust. "Witnessing this state of the market during formative years of their lives shaped their perceptions, leaving them very skeptical about investing and the markets in general," said Garrett Silver, head of investing products at Capital One ShareBuilder. Of course, the financial crisis isn't the only reason why young people are intimidated by investing. Americans have long been turned off by the industry's complex jargon and perceived high fees and lack of transparency. Flunking financial literacy: It's been a vicious cycle for young Americans. The difficult jobs market following the financial crisis meant many millennials were out of work and struggling with student debt. That means they had little extra money to invest in the stock market. Having money forces decision making and education, State Street's Duncan said. It should be no surprise then that millennials got less than half of the questions right in a State Street financial literacy test. By comparison, Generation Xers and boomers got 57% and 65% correct, respectively. Low financial literacy scores also correspond with lower levels of trust, Duncan said. That may explain why despite their lack of knowledge, young investors are more likely to go it alone when it comes to investing. Eighty-seven percent of millennials say they trust themselves to make investing decisions on their own, compared with 68% of seniors, ShareBuilder said. Retirement crisis looms: All of this suggests millennials may be stuck with smaller nest eggs that will make it more difficult to retire. People who wait too long to invest may not be able to stop working and others who don't understand investing may end up with portfolios that are too risky or not aggressive enough. These concerns are magnified by questions about the government's ability to continue funding Social Security. Despite those worries, 40% of millennials plan to fund at least a portion of their retirement with Social Security benefits, according to the ShareBuilder survey. What can be done? Silver said the financial industry needs to "remove the barriers to investing" through more affordable and transparent pricing, intuitive platforms and less jargon. One large insurance company is experimenting with a new way to persuade young people to get out of cash, Duncan said. Instead of comparing clients' portfolios with a benchmark like the S&P 500, the company, which she declined to name publicly, is displaying the age that the person could expect to comfortably retire if they keep investing how they currently are. The average age for clients in Massachusetts was 104, Duncan said. "That served as a wake-up call. If you continue along this conservative cash plan now, it's not going to make you feel very good about the future," she said. Check the calculator: Will you have enough to retire?